Brad, another dad, and I were talking about sailing, and how much we loved it. Then he warned, “Soccer is about to ruin your life.” He was, of course, lamenting family calendar complexity once kids reach the age where competitive sports clutter everyone’s lives. He had felt it like a brick in the head and was telling me to duck, fast. The shuttling, the interrupted weekends, and the new pace at which his family was sprinting through life had made it impossible for him to find an hour for himself. More, he felt powerless to suggest an alternative that might be more local, less fragmented, or just a tad slower. Brad was especially sad that his time with his kids — just 9 through 15 at the time — had already come to a close. Hadn’t it just started? And Brad wanted to be sailing. He had grown up with it, reaching the 420 nationals as a teen, and the Olympic trials twice as a young adult with his friends in a Soling. But he wasn’t getting much sailing in anymore. Sailing was his passion, not his family’s, so it would take a backseat to soccer, and he would watch from the stands. 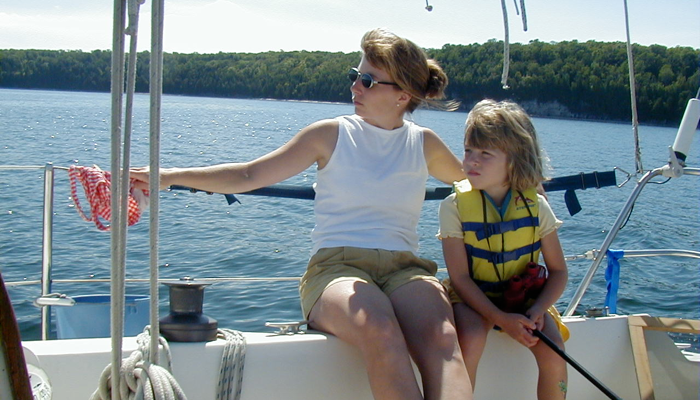 As the book Saving Sailing explains, while there aren’t many sailors in America anymore, there are many Brads: parents wrestling with packed schedules, outside influences, huge expectations and not much choice when it comes to how time will be spent. Or so it seems. Don’t pit sailing against soccer. This was Brad’s first mistake. Given equal weight, sailing takes on the thin veneer of the spectator sport. Sailors know that sailing is vastly different and better on many dimensions, not the least of which is that it is best done in family or intergenerational groups and that in that format, it gets better with time. Draw a clear distinction between kids-sports and family time. One is a game, and it ends. The other is love and it lasts. Start early and make family time a habit. It is, after-all, your key investment in your kid’s future; as important as saving for college tuition. Use it to learn, explore, disagree, cooperate, solve problems and celebrate together. If you think, like I do, that sailing might be a good way to get this done, then do it. Of course it is easier to start early — babies and toddlers can sail too — and this is important if you want it to last into the teen years and beyond. Deliberately recover lost time whenever possible. For parents, this means narrowing choices and coordinating schedules to find and protect overlapping free time: guiding decisions to choose one or two things, not eight, and creating a family calendar that securely anchors the hours that will be spent together. There will always be alternatives. Go sailing and while you’re there, talk about what activities to keep, what to improve, and what to toss. Select programs that are designed for all ages. Like most institutions — schools, libraries, clubs — sailing programs tend to segregate generations, when they don’t have to. In fact, programs that limit participation to narrow age groups (either in policy or timing) do so for artificial reasons. Tell your club or school that you want to learn or compete together. If they respond, great. If not, then in the sailor’s spirit of self-reliance, rally some friends and create your own program that does. Intergenerational program design will be the topic of a future article. For now, know that the Saving Sailing movement is reaching full stride. At its core is the truth that sailing is a fertile place and time for mentoring… …until soccer gets in the way. So don’t let it. You are currently reading Making Time to Sail at Saving Sailing.